1.1. Mountain Star #3 = Quarrels, conflicts and legal entanglements at the Frontage of the unit. Fortunately, the Water Star #6 will lessen the impact. As #6 = Strong metal does help to minimise this. 2.1. Usually SW is considered as the rear of the unit. If so, often this would often be the Kitchen, Service Yard or Air-con ledge or even missing corner. 2.2. If so, the double auspicious #9's current prosperity luck is said to be wasted at the "rear" of the unit. 2.3. Under Flying Star Feng Shui, if there is a choice between a NE1 or SW1 unit? SW1 is preferred. 2.4. 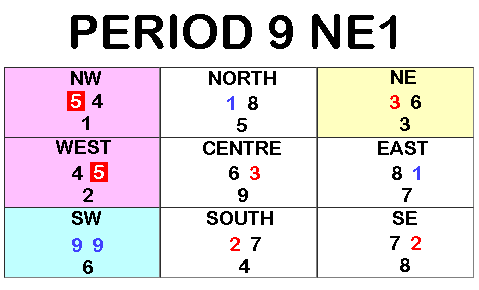 As seen from the above chart, the double auspicious #9's for a SW1 chart is at it's frontage or facing direction. 2.5. Please go to the review of SW1 to understand it's characteristics to see if other sectors of a layout is better or worse-off. Given that there is also some disadvantages vs a NE1 chart. 3.1. Often, for a flat, the bedroom(s) are either at North or East sector. 3.2. For this facing, no issue if the unit has a bedroom at North or East sector. 3.3. Given that both sectors has a #1 = coming prosperity star each. 3.4. However, at North, the #1 is a Mountain Star. While at East this is the #1 Water Star. 3.5. Given this understanding, in this case, it is preferred that the bedroom be located at North: where an enclosed room is favoured by the Mountain Star #1. 3.6. #1 Water Star is auspicious at an open space area such as the Living or Dining room area. 4.2. Ideally, NW or West should not be a bedroom or bedrooms. 4.3. Although not perfect, but NW & West as a last resort could be in the Living or Dining Room area. 4.4. Of course, it would be good if NW & West are at the Toilet and/or missing corner. 5.1. #3 = Quarrels, conflicits & legal entanglements. 5.2. Good if the Centre does not have clear space. Good if it is a household shelter or at the passageway leading into the bedrooms or just outside the shared toilet. 5.3. No matter how, it is inauspicious if the centre has a stove or sink or WC.